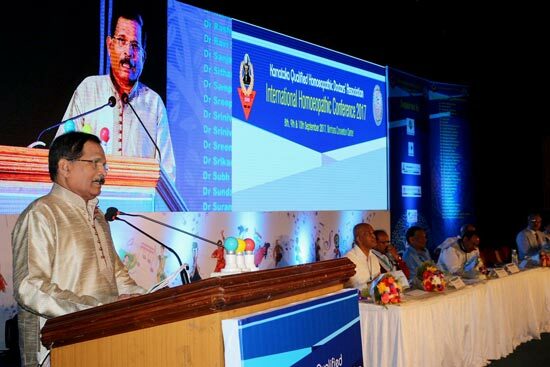 Shri Shripad Yesso Naik (AYUSH minister) has said that the government of India is doing everything possible to promote homeopathy research and wants to encourage new researchers to help make India capable of delivering the latest developments in homeopathy. Shri Shripad Yesso Naik is the Government Minister for the Department of Ayurveda, Yoga, Unani, Siddha and the department of Homeopathy (AYUSH). “My Ministry lays the highest importance to homeopathy research. We have established the Central Council for Research in Homeopathy, a pioneer research organization for carrying out high quality research in all aspects of Homeopathy. This includes clinical research, drug standardization and basic research. I am happy to share that this Council is also spreading its wings to collaborate with reputed international and national institutes for undertaking valuable research in homeopathy such as exploration of homeopathy as a Nano-medicine. We are inculcating research aptitude in students through specially designed schemes of scholarship in addition to capacity building of homeopathic colleges”, said Shri Shripad Naik. Emphasizing the efforts of Government, Shri Shripad Naik (AYUSH) said that government is giving all out support for undertaking world class homeopathy research. Various MoUs have been signed with reputed organizations in UK, USA, Argentina, Canada, Armenia, Mexico, Germany and Brazil to encourage joint research projects, exchange of information, documentation and scientific publications, joint conferences and exchange of experts for training of practitioners, scientists, teaching professionals and students. 2. A state of the art homeopathy virology lab has opened in Kolkata. India’s first state-of-the-art virology laboratory has been opened at Dr. Anjali Chatterjee Regional Research Institute for Homeopathy Research. The laboratory has been established to develop new drugs and technologies in Homeopathy to combat the emerging challenges of viral diseases. The laboratory is the first one in India for conducting basic and fundamental homeopathy research for viral diseases like influenza, Japanese encephalitis, dengue, chickunguniya and swine flu. New drugs and technologies would also be developed to combat the emerging challenges of viral diseases. Commending the contribution of Homeopathy in controlling endemics of cholera and viral infections Naik said, “In the changing world scenario where new strains of organisms are creating havoc, different regions are being affected by epidemics of Dengue, Chikungunya, Malaria and Swine Flu, Drug Resistant tuberculosis is endemic in various regions and is affecting the poor and under privileged population, I call upon the Homeopathic profession to contribute in this very important area and help the Government in the management of these epidemics. We should develop indigenous technologies and drugs that are scientific, efficacious and cost effective to tackle these diseases’, he added. Shripad Yesso Naik inaugurated the lab recently. In his inaugural address the AYUSH minister appreciated the popularity of Homeopathy in West Bengal. 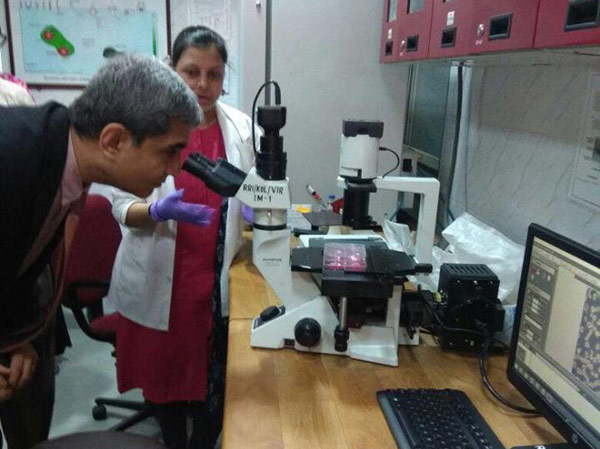 The Minister expressed his satisfaction with this laboratory in the Calcutta University which will undertake future virology research work with the PhD students in Homeopathy. The Ayush Minister also appreciated efforts of the National Institute of Homeopathy (NIH), Kolkata which is imparting higher education and training in homeopathy under the Ministry of Ayush and urged that both the institutes could forge an active collaboration on practical training to the students and research scholars in virology, virus research, both in laboratory and in the field jointly. Naik expressed happiness over the Council’s initiatives of establishing a Centre of Excellence in Fundamental Research in Homeopathy, Howrah to undertake fundamental research studies in homeopathy with an interdisciplinary approach. This institute has undertaken several clinical research studies like autism, psoriasis, vitiligo, breast cancer, hypertension, migraine etc along with proving of new drugs in homeopathy with their clinical validations. About 400 patients are being treated daily through OPD services and AYUSH outreach services being provided in villages too. Shri Shripad Naik has said Homeopathy is an effective and cost effective treatment of medicine. The Indian Government is committed for its further propagation as a matter of policy. He said, in India, it is used as one of the most preferred systems, be it for the day-to-day illness, or chronic ailments. Delivering his valedictory address at the 20th National Homeopathic Congress of HMAI at Margaon in South Goa, Mr. Naik said that so far, there are about 200 colleges, more than 8000 clinics in public sector and almost 300 thousand registered practitioners of homeopathy. High quality education is necessary to place Indian Homeopathy at a world level, the Minister said. The Union Minister further said that during last three years, AYUSH Ministry has taken up unique initiatives for integration of Homeopathy and its physicians in a National Program for the prevention of Cardiovascular diseases, Diabetes, Cancer and Stroke, Mother & Child Healthcare etc. This is helping to push research in homeopathy medicine. These are 3 Government initiatives that boost the indomitable spirit of homeopathy in India.